Hello everyone, Lenzi here with a super hot holiday tip. Now that all the coolest boys and girls are picking up Bif Bang Pow! 's Big Lebowski and Flash Gordon action figures to pass along to friends and lovers, there's one more super cool action figure that must be had: the Black Robed Ming Variant. 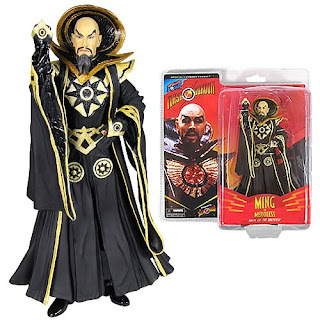 That's right, a very limited number of action figures have been made of Ming in his black decoed outfit, and Entertainment Earth is the only place you can go to get 'em. He's as cool as the regular version, but in an even more foul mood. Head on over now to grab whatever's left, and of course, to pick up any last minute gifts from EE before the holidays are over. Why settle for a White Christmas when Ming can bring you a black one?